The most exciting life you can experience is the Kairos life, filled with adventure and surprises. Once you enter this kind of life you will never wish to go back to the old way of living. It is how Jesus lived His life. Most of us are driven by the clock and busy lives and deadlines; but Jesus lived His life free from such constraints. His relationship with His Father and loving and serving people were at the heart of what allowed Him to live a kairos life. A perfect example of a kairos moment is when my wife Jo and I were hosting a Christmas dinner in our home for some people from our church. As people were arriving, I noticed that Jo was at the front door talking with our neighbor Marcy. I had been to the ATM the day before and there was two hundred dollars in my wallet. I asked Jo to get a Christmas card ready and said I would go and see if Marcy was still awake. I gave her the card with the gift inside. When I talked to Marcy’s husband the following week, he told me that when Marcy told him about the gift he almost cried. 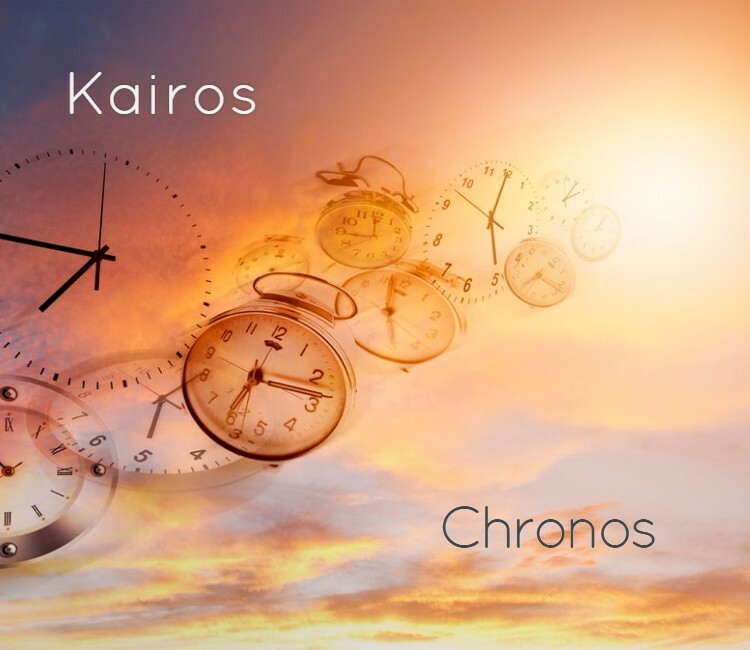 Like our story with Marcy, kairos moments frequently occur when we least expect them and they seldom fit into our self-determined plan for the day. They are often viewed as intrusions in our lives. Each time one occurs, we are forced to make a choice. Do I disrupt my plans and choose to lay them aside for the sake of what God is doing in the moment? I have often thought that when Jesus gave the parable of the Good Samaritan, He was making a comparison between the way He lived His life and the way the religious leaders of His day lived theirs. The priest and the Levite were too busy after their temple service activities to stop and care for their desperate “neighbor” who was beaten and robbed and left to die by the side of the road. Oddly enough, Jesus uses the most despised in society in that day, the Samaritan, to demonstrate extraordinary “neighbor-love.” The religious leaders missed out on the kairos moment. Helping may have been an inconvenience. They may have been late in getting home, or perhaps there was too much risk involved. They could not be bothered. You may be asking now, “How do I move from seeing these moments as more than impositions and enter into the kairos life?” During the early development of Neighborhood Initiative, the Lord helped me understand that there were two ways I could choose to move forward with this good work that He initiated. I could choose to try and make things happen on my own or I could join Him in what He was doing. This is at the heart of the kairos lifestyle. I discovered the first approach was difficult and frustrating, because I was trying to make things happen. The second approach was easy and full of wonderful surprises, because God was inviting me in to what He was already doing. I found the same to be true in my own neighborhood. If I wanted see God’s kingdom move in it, then I needed to relinquish my good intentions and plans and surrender my will to the work that He was already doing with those in my neighborhood. It was a new revelation for one who had, for years in ministry, relied on coming up with a strategy to reach people with the gospel. It was so freeing to rely on God to lead me in to relationship with those in my neighborhood. I was experiencing what Jesus spoke of, “Take my yoke upon you and learn from me, for I am gentle and humble in heart, and you will find rest for your souls. For my yoke is easy and my burden is light.” I was experiencing the easy yoke with Jesus. Some of you may be asking, “What is a yoke?” A yoke is a wooden crosspiece that is fastened over the necks of two animals and attached to the plow or cart that they are to pull to make sure they are moving in the same direction. I learned that it was Jesus carrying the heavy weight and I was joining him in the easy yoke with Him…He took away the burden and any sense of guilt in serving God in my neighborhood. In the early days of Neighborhood Initiative, Dallas Willard, a dear friend and well known philosophy professor at USC, one who walked closely with Jesus and deeply respected by many Christian leaders, told me, “Don’t stop doing what you are doing. If you keep moving forward with what you are doing, we will see revival and awakening.” These were significant words coming from Dallas, one who chose his words carefully. I took what he said to heart. If you have listened to or read much of Dallas, one of his noteworthy quotes among so many was, “Don’t ever try to make anything happen.” I watched this up close and personal in his life. He didn’t need to promote himself or try to make things happen, yet God used him greatly to influence so many lives in and outside the church. He understood and lived in the “easy yoke” with Jesus and did what the Father was doing; by this yoking with the Lord, he was in one accord with Him. You probably have a set way that you pray…I would encourage to stay with the way the Lord has directed you. I believe prayer, conversing with God and Him with you is a personal matter…there is no one way to do it. I am sure we can all learn from others, but I have found in this season of my life that prayer walking has become most refreshing for me. It allows me to be focused as I listen and talk with my Father. Each day of the week, I walk and pray with a different focus in mind. On Tuesday mornings, I walk through my neighborhood and I pray for each of my neighbors by name and I ask the Lord to show me what He is doing in their lives. Sometimes He will speak to me about my neighbors or give me ideas of what He would like me to do. Sometimes I hear nothing or see nothing happening and I have boldly asked Him, “Is this a fruitless activity?” He has faithfully and dramatically, like the story of Marcy, shown me that He is in favor of my weekly prayer walks in my neighborhood. So I have continued to make this my regular practice. Rather than try to make something happen in my neighborhood after I pray, I wait for Him. This kind of waiting is not a passive waiting, but a waiting with a sense of expectation. When Isaiah speaks of “those who wait on the Lord” in Isaiah 40:31, he is referring to a waiting with expectation and that’s the kind of waiting I do. I pray and then I wait for the next thing the Father invites me to do with Him in my neighborhood. I have been prayer walking through our present neighborhood for years. I must confess, in the early days, I would question if anything would ever happen in our neighborhood. But in time relationships have begun to open like flowers. There is a tendency to want to make something happen like a child wants to force open a budding flower before its time. But if you pray and wait, God is faithful and begins to open the hearts of people in your neighborhood like He opens a flower to display its beauty. Then I watch and out of nowhere something will happen that I least expect. A neighbor will call me and ask me to perform a wedding at his home or another will ask me to officiate at a funeral for someone in the neighborhood. Or, a fifty-foot tree is blown down in front of our home, a car is crushed, the tree lands on our neighbor’s house across the street, and an opportunity opens up with a neighbor. Or, I follow an ambulance up the street and that experience opens a new relationship with one of my neighbors. You can’t control, anticipate or predict; however, because of His sovereign working and prayer, God has invited me in to participate in His ongoing work. Patiently waiting and watching for God to do His work in your neighbors’ lives can, at times, become discouraging and may cause one to lose heart, because we don’t see results immediately. We want the work to take place in our time. We might even find ourselves trying to make something happen in the lives of our neighbors to hurry the process along. The story of Frog and Toad: The Garden, a children’s book, gives a helpful parable for us who are impatient with this process. Here’s a summary of the story. The Frog and Toad story helps us better understand what Jesus conveys in the Parable of the Growing Seed, “This is what the kingdom of God is like. A man scatters seed on the ground. Night and day, whether he sleeps or gets up, the seed sprouts and grows, though he does not know how. All by itself the soil produces grain—first the stalk, then the head, then the full kernel in the head. As soon as the grain is ripe, he puts the sickle to it, because the harvest has come.” (Mark 4:26-29) Often, the process with neighbors is slow. But one day, when you least expect it, God surprises you with an invitation to join Him in His work with one of your neighors, like He has with me on so many occasions. Living the kairos life with the Father is like a little kid who is waiting for his dad to invite him on a new excursion with him. He knows that only dad can drive the car and he waits for his dad to say, “Come on, kid! I have a wonderful surprise for you. Let’s go!” And off they go together with dad in the driver’s seat. This is the adventure I spoke of earlier. This is the kairos adventure: becoming like a child and enjoying the ride with Dad on an amazing journey through life with those in your own neighborhood.